Smart use of lighting at the Oceana Residences apartment. 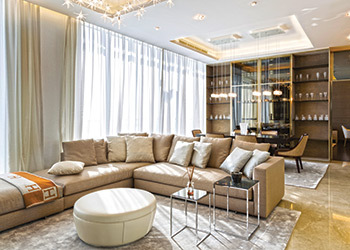 Bishop Design Residential is vying for yet another award, this time for a luxury apartment at Oceana Residences in Dubai, which has been transformed into an elegant apartment with a practical layout. 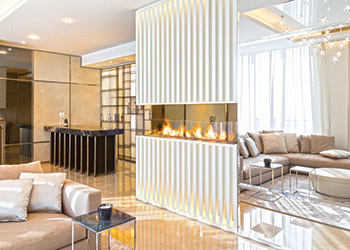 A private apartment at Oceana Residences, Palm Jumeirah in Dubai, UAE, featuring a luxurious yet contemporary design, has recently been handed over to the client by Bishop Design Residential, an international award-winning interior design consultant. The project has been submitted for the International Property Awards, which are due to be announced later this year, according to Ellen Bishop, the Dubai-based managing partner of Bishop Design Residential. Oceana Residences is an opulent beachfront resort with panoramic views of Palm Jumeirah. “The clients are a young couple who spend most of their time in Monaco. They are hoping to expand their family and utilise the 2,470-sq-m apartment as their home away from home, so it was imperative that a spacious setting was created,” explains Bishop. The young couple wanted an elegant waterfront apartment that offers a practical layout with beautiful and refined materials and storage options. “The existing layout of the apartment did not fulfil their requirements, so essentially we had to start from scratch. Bishop Design Residential carefully re-planned the entire space and achieved much larger rooms that offered a practical yet welcoming home. “The design was to be suitable for a successful couple so needed to be glamorous, luxurious yet understated for when they were entertaining. However, their desire for a family also meant that every element was practical and offered longevity and was suitable for a growing family,” she adds. The layout was essentially transformed following their brief for a larger master bedroom, addition of a maid’s room, a larger kitchen and one big open space for living, dining and bar. The only sacrifice we had to make was that the powder room became a part of the second guest bedroom but we solved that by creating a small lobby which they were happy with,” Bishop explains. The overall colour palette of the apartment is very soft and low key. Bishop Design Residential has created a lobby area, which helps to delay the sense of arrival as guests entered. “We added interest to this separation wall by introducing layers of light and a double-sided fireplace so that you could still experience the view of The Palm,” she points out. The smart use of lighting in the main living space helped frame the room, where different light fittings in glass and metal have been used that do not obstruct the view but provide additional ambient lighting above the living space, dining room and bar. The ambience has also been enhanced with layers of indirect lighting in the ceiling, in addition to clusters of pin lights and crystal downlights, while allowing the client to control the mood of the room. Furthermore, the interiors are fitted with opulent materials such as suede and mirrors for the wall cladding – which have been cleverly placed to reflect the view of the ocean – and dark grey mirrored full-height doors, while champagne metal lines enhance and frame each design to create symmetry through the main lobby, bar, living and dining areas. “The use of these metal lines also creates a seamless design within the main area that allowed Bishop Design Residential to conceal the many doors and almost camouflage the much-needed storage. This gradually became the design signature of the apartment and one of the main design elements,” she says. The master bedroom has been furnished with a practical vanity and desk unit for him and her, suede panels in the ceiling and warm elegant colour tones and textures dressing the walls. The master bathroom was made larger to accommodate a Jacuzzi and steam room. Both guest bedroom suites needed to be approached with slightly different styles, one more feminine and one leaning towards a more masculine style. This allowed the client to utilise each space in correlation with the guests they had staying and also gave them the flexibility for a future nursery without having to make too many changes to the hard finishes used. The overall colour palette of the apartment is very soft and low key and is consistent throughout, offering a warm and inviting space for the family and guests alike. The detailing of the joinery and bespoke elements are pivotal in turning the client’s brief into reality and making the space modern yet timeless and with a distinct sense of luxury. “What was an otherwise bland apartment has now been transformed into a modest yet stylish and desirable family home,” she adds. The huge changes in mechanical, electrical and plumbing (MEP) services took a good portion of the budget, but this allowed Bishop Design Residential to redesign the ceilings and layer the lights in a way that also concealed the air-conditioning grilles, which is much more aesthetically pleasing. The separation wall in the lobby area ... features layers of light and a double-sided fireplace. The overall completed look is now an impressive space with spectacular views, sumptuous finishes, clean lines and a beautiful warmth throughout. “One of the most important elements of this design was the changes to the overall layout which allowed us to maximise each room without compromising on space from anywhere else. The clever use of the double-sided fireplace still allowed the eye to see the amazing view, whilst also delaying the sense of arrival and creating a small lobby, which was an important component to this design. We also had to take advantage of the magnificent view, so the use of reflective materials and cleverly placed mirrors ensured the view and natural daylight was bounced throughout the room,” Bishop adds. The clever use of glass lighting allowed sufficient decorative elements to the ceiling. The small star-shaped pieces beautifully reflect the interiors and complement the sea, whilst also mimicking a starry night sky when the sun sets. The emphasis on sophisticated textures, sumptuous finishes, clean lines, clever layout planning and selection of lighting makes for this wonderful space created.